Pension Advice you can trust. The financial challenges facing us today are varied and demanding but one that remains constant is the desire for a reliable income providing security in retirement. With people now living much longer, the need to provide choice and security at every stage in life has never been greater. Our financial advisers have a wealth of experience of helping clients properly plan for retirement and will be happy to guide you through the number of pension savings options available. We’ll take the time to understand your circumstances and help you choose arrangements that best suit your needs. One of the initial attractions for investing into a pension fund is that all contributions, up to the annual limits, attract tax relief. This means basic rate tax payers only pay 80% for their pension, while higher rate tax payers only pay 60%. The difference is made up in tax relief claimed back from HMRC. Employers that make pension contributions can also claim full corporation tax relief on payments into directors or staff pension schemes. Contributions into pensions can be invested in a wide range of assets. The growth of these assets will be aided by the fact that no capital gains tax applies to pension fund assets – meaning that pensions grow predominantly tax-free. There is a great benefit of starting to build a pension fund as early as possible as pension funds benefit from the combination of tax relief and tax-free compounding growth. The range of options that are now available to people at retirement is wider and more flexible than ever. People can access their retirement savings from age 55. Funds can be converted into a guaranteed income for life or retained to provide a flexible income. People who elect to enjoy a flexible income arrangement are able to pass their funds on their death, to their spouse, children, grandchildren or friends. Pension funds once seen as retirement assets only are now legacy assets that multi-generations can enjoy free of inheritance tax. Chris has the personal touch - he’s very approachable, down-to-earth and you don’t feel intimidated, if we’ve got a question, he’s always at the end of the phone. 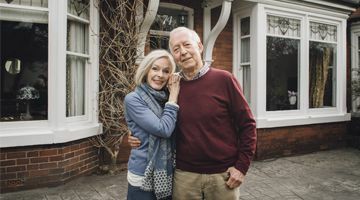 Read Tony and Paula’s story..
Maximise your returns with a level of risk you’re entirely comfortable with and make better informed pension decisions that are right for you. Our financial advisers have a wealth of experience helping clients with their pensions and retirement planning. We can help you build and benefit from pension funds. We believe it’s important that you to have confidence in your pension arrangements and the peace-of-mind to enjoy your whole life to the full.